Olympian, All-American & 2x Pan American Games Champion. Paige’s journey in field hockey began at the age of ten when her mom (Judy) signed her up for a field hockey camp near Wilkes-Barre, PA. By the time she was in 7th grade, she was playing for the junior high school team and her freshman year she had made the Varsity team. Her mom sadly was not able to see much of her journey in the sport as she passed away in 2005 from complications due to ovarian cancer while she was in high school. Judy was invested in her daughter, academically and athletically. While fighting cancer, Judy would continue watching Paige play all the way till the end. Her dad (Brian), raised her (from age 15) and her brothers (Brad & Greg). Brian was able to balance a great deal with 3 kids and help all of them try and reach their true potential. After his wife passed, Brian wanted to make sure Paige continued on her athletic path as long as she enjoyed it. Field hockey was a place that Paige could excel, show her passion and dedication for the sport that her mom helped her find and it ultimately became a cultural gateway for her to get to experience many places around the world like Holland, China, Mexico, Australia and Argentina being identified at an early age by US Field Hockey (USFH) as a natural in the sport via their Futures Program. Players identified for this have tryouts beginning at high school age and move up the ranks from there. Paige was picked for USFH U-16, U-19 & U-21 teams in subsequent years. Having been identified by USFH & becoming a regular on all of their junior national programs, she was heavily recruited by the nation’s elite NCAA D1 schools and ultimately decided to go to the University of Virginia. UVA she deemed would be the best fit between academics and athletics which was an attribute her mom thought about. Many of the schools she went to didn’t have the same mix that she was looking for where she could enjoy being a student-athlete. During her time at UVA while ultimately not winning a NCAA Championship, she will earn her degree in English in the Summer of 2013. On the pitch, she was dominant becoming UVA & the ACC’s all-time leader in points, being a 4x All American, a 2x NCAA All Tournament Team member and in 2011 as well as 2013 winning the State of Virginia Female Collegiate Athlete of the Year. Her UVA head coach passed along this note to her which she keeps in mind all of the time, “Hard work beats talent when talent doesn’t work hard.” This motto drove Paige during her NCAA career, but it also led her to the Women’s National Team which selected her in her sophomore year to pull double duty. 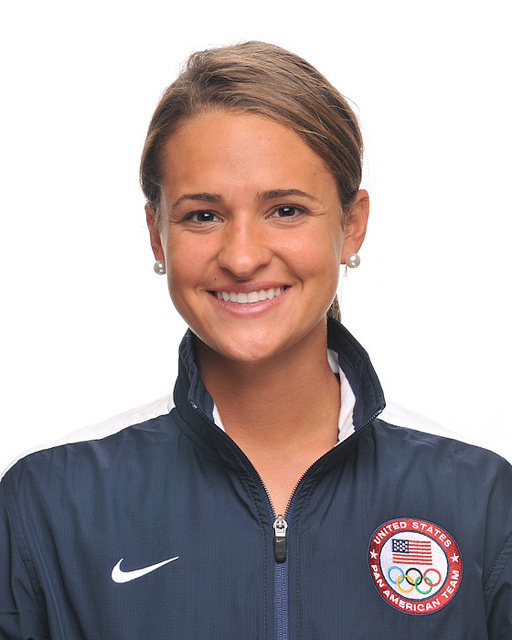 Paige put her UVA career on hold to train with the US National Team in Chula Vista, CA in 2011 and was ultimately selected for the 2012 US Olympic Team. To qualify for the London Games, Paige was a member of the 2011 Pan Am Games team which earned the US a spot in the Olympics on the basis of their Gold medal and would represent the hemisphere. London did not turn out the way that the US team had hoped & they finished outside of the top half of squads. Paige brings the fight to everything she does day in and out because of her mom. She is forever inspired by her. Post-graduation, Paige continues on with her Olympic dream and is in training full-time with the US National team in Lancaster, PA with the hopes of capturing an Olympic medal at the 2016 Summer Games in Rio de Janeiro. In the spring of 2013, Paige was a guest of the White House and took part in the annual Easter Egg Roll as an athlete ambassador. She is pictured below with one of her teammates from both the national team and that of the University of Virginia, Michelle Vittese as well as 2012 NFL MVP, Adrian Peterson of the Minnesota Vikings. In September of 2013, Paige added her first corporate partnership in the field hockey category with Longstreth Sporting Goods and Gryphon FH Sticks. Paige played in the 2014 FIH Field Hockey World Cup for the United States in The Hague, Netherlands and in her first match of the tournament, she celebrated on the day of the 100th cap, with a goal in a 2-1 upset victory over 3rd ranked England. Team USA after the round robin advanced to the semi-finals where they were beaten by eventual World Champion The Netherlands in a shootout and then lost the Bronze medal game to Argentina by a goal. The US' 4th place finish at the World Cup was the best by a US squad in 20 years. In Fall of 2014, Paige signed a multi-year deal with Nike. The Summer of 2015, gave Team USA the opportunity to take the easier path to qualify for the Rio 2016 Summer Olympics by winning the Pan American Games except that it would take place to our neighbors to the north home field advantage in Toronto, ON who would be looking to punch their ticket the same way. Team USA was able to make it to London 2012 in a similar manner upsetting perennial power Argentina in the final. For the 2015 Pan Ams the United States swept their round robin group and their path for Gold would go through Canada in the Semi-Finals and Argentina in the Finals. Through the round robin, quarterfinals and ultimately versus Canada, Team USA did not surrender an opposing goal in the entire tournament. The same held true for the Gold Medal game vs Argentina until the Argentinians scored with a minute to play with the U.S. holding a 2-1 lead, it was quite an exciting ending, but the U.S. held on to win and punch their ticket to Rio. During the course of the Pan Am Games, ESPN the Magazine launched their annual BODY Issue in which Paige was one of the athletes who was selected to participate in the 2015 issue which she had shot in the Spring. Paige was the first athlete from her sport of Field Hockey invited to take part and upon the shoot ended up with a double page and single page which was more than what most of the other athletes who participated received. She was very proud of the final product shot by renown celebrity photographer __________________ . In November 2015, Paige was selected by both SELF Magazine for it's July 2016 Olympic issue and an invitee to the NBC Olympic Promo Shoot in Los Angeles to represent her sport. The NBC Olympic Promo Shoot she was the first in Field Hockey to represent her sport as well when the top 125 Olympic hopefuls of the Olympic and Paralympic world come together for all of the promos that NBC will showcase to invite America to watch the Games. Paige is currently living in Mount Joy, PA and the US National Team is training out of in Lancaster, PA.